Traditions are about as sweet as strawberries, and Ponchatoula has a long and rich history of local traditions that stretch as far as a row of strawberries in the field. Ponchatoula was originally established as a mining camp in the 1820's and has throughout the years progressed into what it is now know by as, The Strawberry Capital of the World. With many events held all year round, one that is surely to be a fun family time is the Ponchatoula Trade Days. Trade Days have become a staple of Ponchatoula, allowing the community to sell antiques, collectibles, crafts, art, food, and even has live music, face painting, and other children’s activities including a petting zoo. With all there is to do and see at Ponchatoula’s Trade Day, it makes for a fun event for the family to attend. Trade Days in Ponchatoula have been an ongoing event since 2006 and has become bigger and even more popular with each passing year. But with Trade Days being such a well know Ponchatoula event, it might be rather surprising to find that the beginning of Trade Days had a rocky start. The first Trade Days was set for November 2005. However, it would be postponed until March 2006 due to the destruction that Katrina dealt to Louisiana in 2005. Not even a natural disaster as devastating as Katrina could keep the local Ponchatoula community down for long. The community came together and with the postponed date the locals were able to organize the very first and very successful Trade Days in Ponchatoula. 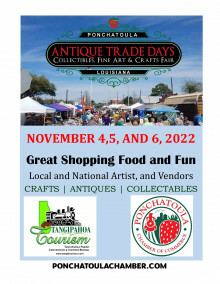 Since 2006 Trade Days is held the first weekend in March and November in the Ponchatoula downtown commuter parking lot. And this year’s Trade Day is estimated to top 200 booths, and with even more vendors there will be twice as much fun to be had at Trade Days. For vendor application and information, please contact the Ponchatoula Chamber of Commerce at 985-386-2536 or Chairperson Judy Berner at 985-351-4029. You can also email the chamber at chamber@ponchatoulachamber.com. You can also download and print the application from the link below.